-First calves have been outstanding, have lots of pigment, muscle, and very fancy. -Porterhouse has the following ratios from a deep set of contemporaries: WW 123, YW 114, REA 103, and IMF 112. 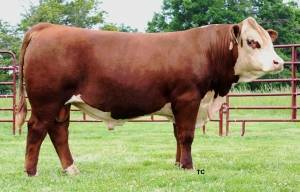 -His dam is a top producing 719T daughter that descends from the Candace 154 cow family. -Porterhouse's performance, carcass data and EPD profile makes a nice package. -Porterhouse was the second high selling bull in our 2015 sale to Walker Polled Herefords, Morrison, TN, Jernigan Farm, Columbia, TN, Crouch Polled Hereford Farm, McMinnville, TN, & Dirt Road Farms, Franklin, TN.